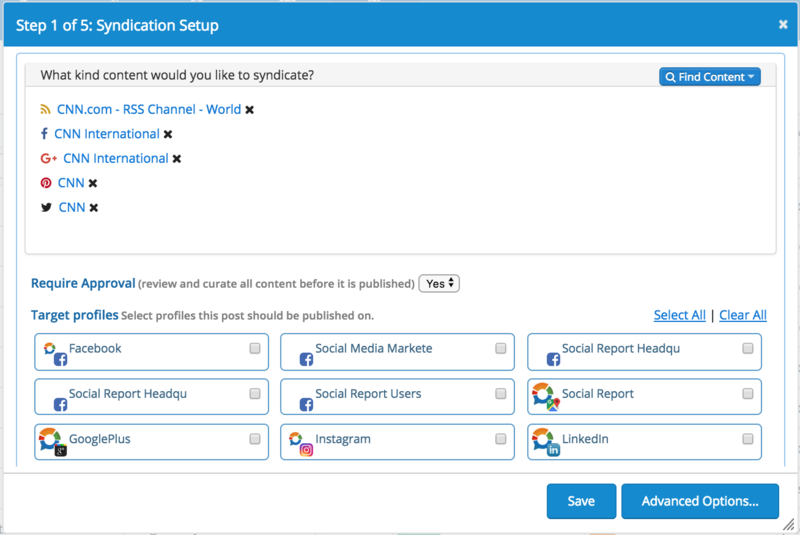 Social Report offers a variety of publishing options. One of them is the ability to take an RSS Feed or social media profile and connect it to your project so that whenever there is a new article on the feed or post on the profile - it will automatically be published to specified social media profiles. You may have a blog that already produced content on a scheduled basis and you simply want those posts to be automatically distributed to your social profiles. You might want to post content related to a particular topic and there is a news site or a blog that you want to get that content from. You have your own post creating, review and approval process and prefer to use that instead of having users manually repost articles. You want to repost content from other social profiles onto your own social profiles. Supports all valid RSS feed formats. Social syndicating can be done from Facebook, Twitter, Instagram, Google+, and Pinterest. Control schedule and number of posts on a daily basis. Pick time slots and decide when content should be published. Pick post targeting like country, language, and geocoding.